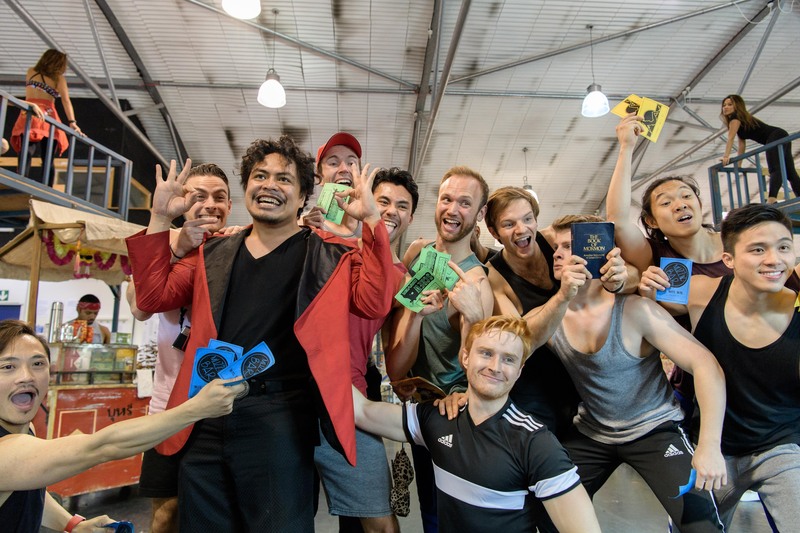 In a huge hangar-like rehearsal space in London, the cast of the new tour of Miss Saigon are nearing the end of the first full run-through of the show. Saigon has fallen to the Vietcong and life is hard for those who used to party in the city with the Americans. But one figure is hoping his dream ticket is about to come up. Believing a visa for the United States is just within his grasp, The Engineer breaks into song. One of the most memorable tunes of the show, The American Dream sees this colourful character picturing his new life – complete with money, women and safety. 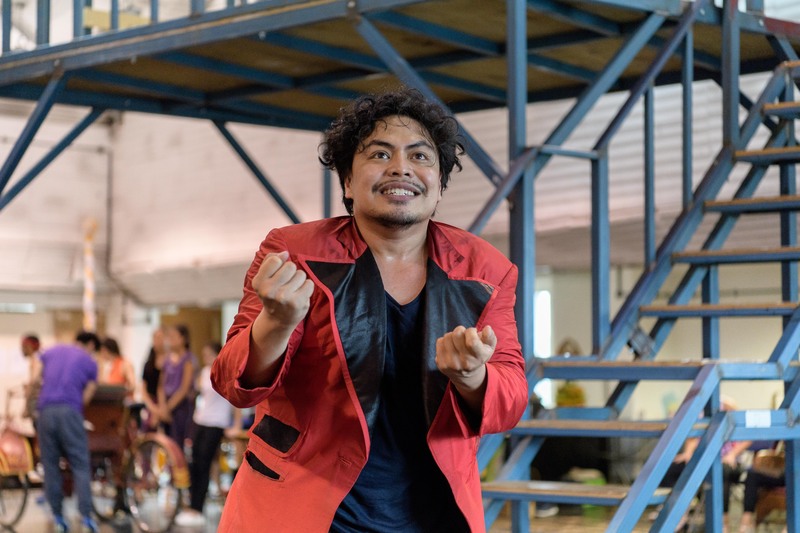 It may be a rehearsal but actor Red Conception as The Engineer quickly has us all captivated as he runs around the space, flinging wide his red jacket, picturing this new world, grinning and even reaching out to grab at the money he imagines falling into his hands. The Engineer is a complex character because he's greedy, selfish, manipulative and ruthless – and yet he's so open about his faults the audience can't help but like him just a little bit. Seeing the opportunities a war can bring, he exploits every possibility to improve his life. Half an hour later, with rehearsals over, Red explains why he was so keen to be part of the show and to take the role of The Engineer. "I come from the Philippines and Miss Saigon is huge there. From the very beginning, there were Filipino actors in Miss Saigon so in Manila it's a dream to be in Miss Saigon," he says. "I had actually never seen the entire show, just clips on YouTube, although I had heard the soundtrack. It's beautiful and there is nothing like it. The music is so lush." Red is joining a year-long tour which opens in Leicester in July and is currently set to close in Norwich in September 2018. The show visits Birmingham Hippodrome Theatre between 26 July and 23 September. First produced in 1989, Miss Saigon has been a huge hit in London's West End, on New York's Broadway and around the world. It's been performed in nearly 30 countries more than 300 cities and has been seen by more than 35 million people across the globe. Revived in the West End in 2014, the current show celebrates 25 years of Miss Saigon. And Red is keen to stress that the musical, which is a love story set in the Vietnam War, has not dated over the years. Red says: "There is almost no better time to do Miss Saigon than now. The political situation in Manila is crazy and this is a reminder of what war does to people. I think people should see it and, to be a part of a company relaying that message, is very important to me." Playing the complex character of The Engineer was not without its challenges but Red has been hugely supported to develop the role. "It's a very exciting part and I had a lot of help from the creative team in creating the part," he says. "Actually they said in a way it was helpful that I hadn't seen Miss Saigon before because it meant I could come to it with my own take on it and not be too influenced by other Engineers." Part of that support meant getting to know The Engineer – and what makes him tick. "When we started rehearsals, they made us read a lot of books and watch documentaries about how Saigon was at the time and what happened in the war and what happened to the Vietnamese people so we understood more about what the show is about," recalls Red. "You need to have that emotion in order to honour what those people went through. And he adds: "Playing the Engineer, and when you think about what he wants, to be American – that is what happens in war. The Engineer does not appreciate who he is – he sees how it is on the other side of the world and he wants that. Coming from the Philippines I can kind of relate to that. The Philippines was under colonial rule for a long time and although I didn't personally experience that, we do carry it on our backs every day. So I can kind of understand what The Engineer wants." Red may be new to Miss Saigon but he has plenty of experience of musical roles in the Philippines including a double award-winning performance as Adam/Felicia in Priscilla, Queen of the Desert. And he is fully aware that he is following in the footsteps of many great performers. Red says: "People have high expectations of Miss Saigon and that is a tremendous pressure but we are all giving it the best we can to give people the best show – people won't be disappointed. Even if people have seen it before this will be a very different experience because we are very different people and we have very different takes on the characters so it stays fresh."